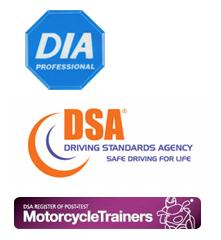 The Enhanced Rider Scheme is a DSA post-test training scheme primarily aimed at Direct Access big bike riders who want to take their training that little bit further. At the end of your Enhanced Rider Training you will receive a DSA Certificate of Competence – Enhanced Rider Bonus and should be eligible for an insurance discount. The Force Rider Training Enhanced Rider Scheme is a popular post-test option for the more serious biker. It will help make you an even better rider, develop your road craft and help keep you safe. After many years of riding i decided to get a little more training to make sure that i was as safe a rider as i could be. I very quickly realised that the bike test i had passed in the lat e80′s had been a waste of paper, i thought i may have a few bad habits but some things i was doing in my riding i now know were dangerous, but until someone as highly experienced as Andy comes along I was oblivious. I now think about what i’m doing when i ride, asking myself is this the safest thing i can do on my ride. Really eye opening couple of days with Andy, its made me sit back and think why i hadn’t done this years ago. I feel far more confident on the bike and i know its made me more aware of whats happening around me, my friends recon its made me ride faster but i think its cause I’m looking father down the road and anticipating better reading the road. Thank you Andy. i will be back so you can see how i’ve progressed and where i can improve.